Tsuge | Chicago's Pipe, Cigar & Tobacco Store | Iwan Ries & Co. Sweeping floors and polishing Mr Umibata’s ivory cigarette holders from six in the morning to ten at night, apart from short breaks for meals, was hard work for a recently orphaned thirteen-year-old. Yet, Kyoichiro Tsuge was not one to be disheartened, and his determination drew on an inner strength. 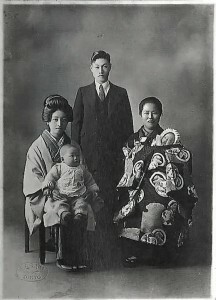 It is likely that he inherited his passion for excellently crafted objects, love of fine things and pleasure in his craft from his ancestors, as his father Tomosaburo had come from a family of swordsmiths with Samurai status in Japanese society, and his mother, Kei, descended from Kanewaka, the famous sword forger. After Kyoichiro’s parents death, his uncle who ran a cigarette shop recommended him to go to Tokyo, and Kyoichiro entered apprenticeship with Mr. Umibata, a maker of ivory cigarette holders, learning day after day, year after year, until he became a highly skilled craftsman. At the age of twenty-six, in 1936, he was ready to take on two important challenges: getting married to Tamae, and starting his own business making cigarette holders. This was the beginning of what is today the most important Japanese pipe-making company. Following the Meiji Restoration in 1868, when the Japanese underwent revolutionary transformations under American and European pressure, emerging from isolation and becoming modernized, Kyoichiro’s ancestors lost their prestigious status. Imperial decrees were issued that greatly limited the tradition of carrying those fine swords that had been so finely crafted by his forefathers, compelling them to halt production or use their skills in another field. Sixty years on, the family’s tradition of excellence was revived in a new, yet at the same time ancient business, that of making cigarette holders, for in that period cigarettes were becoming extremely popular. The techniques used to craft these ivory holders were the same that had been applied by craftsmen for centuries when creating refined objects, especially netsuke. Demand was high, and business continued to thrive until 1941, during the war. However, a shortage of materials and the limit of making luxury items meant that eventually the whole stock of cigarette holders was confiscated and Kyoichiro had to join the Navy, while his machinery was converted to produce gun stocks. After the war Kyoichiro was able to recover his confiscated cigarette holders and sell them at a profit, as their price had trebled in the meantime. Thus, business was resumed. Unfortunately, ivory was unavailable, so the new holders were made of high-quality cherry wood. In post-war Japan many things were unavailable, even cigarette papers. On the other hand, there was plenty of pipe tobacco, and the photograph of General Douglas MacArthur smoking a corncob pipe prompted people to imitate him. Kyoichiro decided to take advantage of this fashion by creating billiard and bent pipes in cherry wood, and business expanded so much that many new craftsmen were taken on, even those from other businesses, such as those making umbrella handles. A large section of the market for quality pipes was military and American, so pipe souvenirs were created, whose bowls were carved with traditional Japanese designs like Mount Fuji, the Seven Gods of Good Fortune, or the Toshogu Sanctuary in Nikko. Some bowls had the same subjects lacquered in bright colours. In addition to pipes, Tsuge was commissioned by the occupying authorities to produce ivory souvenirs, which were carved by as many as twenty or thirty highly skilled carvers. This led to the consolidation of a group of expert and excellent craftsmen who also turned their artistry to making pipes, which became an increasingly important part of production. In the 1950s high-quality briarwood was finally available, and this meant that even more high-grade pipes could be made. Between the 1960s and ‘70s business was at its peak, also fostered by the flow of American soldiers and civilians travelling to Vietnam. By now Tsuge exported to quite a few countries in this area and was also well-known in America and Europe. Yet, the final step towards world-wide fame was only taken in the late 1970s when six of the finest craftsmen in the company visited Denmark and Italy several times. They were welcomed in the most prestigious workshops and factories, and although they knew no Danish or Italian, they managed to communicate with their hosts through gesture and looks, and soon a mixture of curiosity and esteem bound them together, as the universal language of creation transcended any need for verbal exchange. Competence and craftsmen’s secrets were transmitted naturally, learned almost instinctively, which resulted in an intense exchange of knowledge between East and West. Both parties benefited greatly, and the Japanese returned home to make the most of their knowledge of techniques and sensations. A memorable moment was when the great Kazuhiro Fukuda met Sixten Ivarsson, the Danish master pipe maker, and Fukuda was commissioned to undertake Tsuge’s new project of making European style freehand pipes with a Japanese touch. The first items were called “Jimmu” in honour of the first Japanese Emperor, as the idea at first was to create a dating system using the names of different emperors. However, subsequently it was decided to apply a single brand name to distinguish the line of high-quality handmade pipes, and the name “Ikebana” was chosen. This was what would finally bring world-wide recognition to the Japanese company, and access to more difficult markets. In Europe and America it was said that “Japan has sold us cameras, cars, motorbikes and now they are offering us pipes”. On 29th April, 1981, at the age of seventy Kyoichiro Tsuge was awarded with Order of the Sacred Treasure, 5th Class by the Japanese Emperor himself. This was a prestigious recognition of his long-standing contribution to the pipe-making industry. He worked together with his three sons to the end, at the age of ninety-nine, in 2010. Nowadays Tsuge is a well-established company that runs a high-end workshop and factory in the centre of Tokyo and outside. 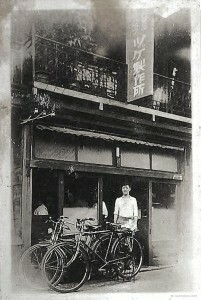 The company’s headquarters lies in the historical district of Asakusa in Tokyo, peppered with art and craft workshops, where Kyoichiro lived for most of his life. The Ikebana line is undeniably international. Other Tsuge pipes are more Japanese in style, with a metal finish or bamboo inserts and refined lacquer veneer. However, what all the models have in common is the meticulous quest for perfection, which Kyoichiro always sought, and which his heirs are determined to continue. Indeed, what his swordsmith ancestors had sought for centuries.